Want to be notified when new products arrive? Complete form at the bottom of this page! Choose from our great selection of whimsical Victorian-inspired glass ornaments in all shapes, sizes and price-points. We cull through our treasured collection of antique "scraps" to find the image that is pefectly suited to its glass counterpart. 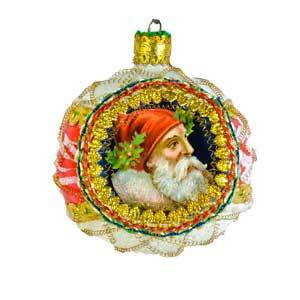 Ornaments are wire-wrapped with German-made crinkle wire, just like the Victorian Ornaments over 100 years ago. Each ornament is designed with antique and early vintage materials (ranging from 130 to 60 years old) and is a work of art, hand-signed by artists Gail or Glenn Giaimo. Would you like us to make a glass ornament just for you? REQUEST A CUSTOM ORNAMENT.